This book presents a comprehensive overview of the science of the history of life. 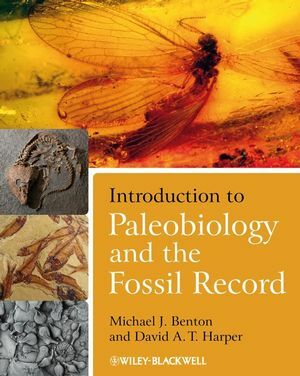 Paleobiologists bring many analytical tools to bear in interpreting the fossil record and the book introduces the latest techniques, from multivariate investigations of biogeography and biostratigraphy to engineering analysis of dinosaur skulls, and from homeobox genes to cladistics. All the well-known fossil groups are included, including microfossils and invertebrates, but an important feature is the thorough coverage of plants, vertebrates and trace fossils together with discussion of the origins of both life and the metazoans. All key related subjects are introduced, such as systematics, ecology, evolution and development, stratigraphy and their roles in understanding where life came from and how it evolved and diversified. Unique features of the book are the numerous case studies from current research that lead students to the primary literature, analytical and mathematical explanations and tools, together with associated problem sets and practical schedules for instructors and students. Michael J. Benton is Professor of Vertebrate Palaeontology at the University of Bristol. He is interested particularly in early reptiles, Triassic dinosaurs and macroevolution, and has published 50 books and 160 scientific articles. David Harper is a leading expert on fossil brachiopods and numerical methods in palaeontology. He is Professor of Palaeontology in the University of Copenhagen, where he is currently Head of Geology in the Natural History Museum of Denmark. He has published over 10 books and monographs, including a couple of influential textbooks, as well as over 250 scientific articles and, together with Øyvind Hammer, the widely-used software package PAST. His time is divided between collection management, exhibition work, research and some teaching. 1. Paleontology as a science. Paleontology in the modern world. 2. Fossils in time and space. Use of fossils: discovery of biostratigraphy. 3. Taphonomy and the quality of the fossil record. Quality of the fossil record. 5. Macroevolution and the tree of life. Evolution and the fossil record. 6. Fossil form and function. Interpreting the function of fossils. 7. Mass extinctions and biodiversity loss. The “big five” mass extinction events. 8. The origin of life. Evidence for the origin of life. 10. Origin of the metazoans. 11. The basal metazoans: sponges and corals. Evolutionary trends within the Mollusca. 15. Deuterostomes: echinoderms and hemichordates. 16. Fishes and basal tetrapods. High-quality, full-color figures and photograph's throughout. Features end-of-chapter discussion questions, easy reference glossary, new references at the end of each chapter, and high-quality, full color figures and photographs throughout. Supplemented by a dedicated web page, www.blackwellpublishing.com/dinosaurs with interactive material and all art in downloadable form (art also available to instructors on CD-ROM).